1. Fahlenkamp D, Rassweiler J, Fornara P, Frede T, Loening SA. Complications of laparoscopic procedures in urology: experience with 2,407 procedures at 4 German centers. J Urol 1999; 162:765. 2. Simon S, Castle E, Ferrigni R, et al. Complications of laparoscopic nephrectomy: the Mayo clinic experience. J Urol 2004; 171:1447. 3. Siqueira TM, Kuo RL, Gardner TA, et al. Major complications in 213 laparoscopic nephrectomy cases: the Indianapolis experience. J Urol 2002; 168:1361. 4. Vilos GA. Litigation of laparoscopic major vascular injuries in Canada. J Am Assoc Gynecol Laparosc 2000; 7:503. 5. Leron E, Piura B, Ohana E, Mazor M. Delayed recognition of major vascular injury during laparoscopy. Eur J Obstet Gynecol Reprod Biol 1998; 79:91. 6. Chandler JG, Corson SL, Way LW. Three spectra of laparoscopic entry access injuries. J Am Coll Surg 2001; 192:478-491. 7. Gill IS, Kavoussi LR, et al. Complications of laparoscopic nephrectomy in 185 patients: a multi-institutional review. J Urol 1995; 154:479. 8. Thiel R, Adams JB, Schulam PG, Moore RG, Kavoussi LR. Venous dissection injuries during laparoscopic urological surgery. J Urol 1996; 155:1874. 10. Meraney AM, Samee AA, Gill IS. Vascular and bowel complications during retroperitoneal laparoscopic surgery. J Urol 2002; 168:1941. 11. Hsu T, Su L, Ratner L, Kavoussi L. Renovascular complications of laparoscopic donor nephrectomy. Urol 2002; 60:811. 12. Usal H, Sayad P, Hayek N, et al. Major vascular injuries during laparoscopic cholecystectomy. An institutional review of experience with 2589 procedures and literature review. Surg Endosc 1998; 12:960. 13. Saville LE, Woods MS. Laparoscopy and major retroperitoneal vascular injuries (MRVI). Surg Endosc 1995; 9:1096. 14. Guloglu R, Dilege S, Aksoy M, et al. Major retroperitoneal vascular injuries during laparoscopic cholecystectomy and appendectomy. J Laparoendosc Adv Surg Tech A 2004; 14:73. 15. Fruhwirth J, Koch G, Mischinger HJ, et al. Vascular complications in minimally invasive surgery. Surg Laparosc Endosc 1997; 7:251. 16. Chapron CM, Pierre F, Lacroix S, et al. Major vascular injuries during gynecologic laparoscopy. J Am Coll Surg 1997; 185:476. 17. Nezhat C, Childers J, Nezhat F, et al. Major retroperitoneal vascular injury during laparoscopic surgery. Hum Reprod 1997; 12:480. 18. Kavoussi LR, Sosa E, Chandhoke P, et al. Complications of laparoscopic pelvic lymph node dissection. J Urol 1993; 149:322. 19. Ono Y, Kinukawa T, Hattori R, Gotoh M, Kamihira O, Ohshima S. The long-term outcome of laparoscopic radical nephrectomy for small renal cell carcinoma. J Urol 2001; 165:1867. 20. Nelson JB, Chen RN, Bischoff JT, et al. Laparoscopic retroperitoneal lymph node dissection for clinical stage 1 nonseminomatous germ cell testicular tumors. Urology 1999; 54:1064. 21. Guillonneau B, Rozet F, Cathelineau X, et al. Perioperative complications of laparoscopic radical prostatectomy: the Montsouris 3-year experience. J Urol 2002; 167:51. 22. Cadeddu JA, Ono Y, Clayman RV, et al. Laparoscopic nephrectomy for renal cell cancer: evaluation of efficacy and safety: a multicenter experience. Urology 1998; 52:773. 23. McAllister M, Bhayani SB, Ong A, et al. Vena caval transection during retroperitoneoscopic nephrectomy: report of the complication and review of the literature. J Urol 2004; 172:183. 24. Chan D, Bishoff JT, Ratner L, Kavoussi LR, Jarret TW. Endovascular gastrointestinal stapler device malfunction during laparoscopic nephrectomy: early recognition and management. J Urol 2000; 164:319. 25. Deng DY, Meng MV, Nguyen HT, Bellman GC, Stoller ML. Laparoscopic linear cutting stapler failure. Urology 2002; 60:415. 26. Sautter T, Sulser T, Suter S, et al. A severe complication of retroperitoneoscopic nephrectomy. J Urol 2001; 165:515. 27. Harkki-Siren P. The incidence of entry-related laparoscopic injuries in Finland. Gyn Endo 1999; 8:335. 28. Hulka JF, Levy BS, Parker WH, Phillips JM. Laparoscopic-assisted vaginal hysterectomy: American Association of Gynecologic Laparoscopists' 1995 membership survey. J Am Assoc Gyn Laparosc 1997; 4:167. 29. Nordestgaard AG, Bodily KC, Osborne RW, et al. Major vascular injuries during laparoscopic procedures. Am J Surg 1995; 169:543. 30. Bhoyrul S, Vierra MA, Nezhat CR, et al. Trocar injuries in laparoscopic surgery. J Am Coll Surg 2001; 192:677. 31. Peters CA. Complications in pediatric urological laparoscopy: results of a survey. J Urol 1996; 155:1070. 32. Thomas MA, Rha KH, Ong AM, et al. 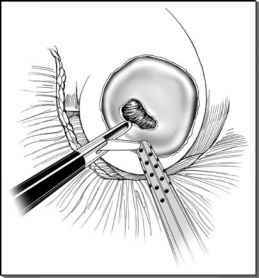 Optical access trocar injuries in urological laparoscopic surgery. J Urol 2003; 170:61. 33. Orvieto M, Breyer B, Sokoloff M, Shalhav AH. Aortic injury during initial blunt trocar laparoscopic access for renal surgery. J Urol 2004; 171:349-350. 34. Sharp HT, Dodson MK, Draper ML, et al. Complications associated with optical-access laparo-scopic trocars. Obstet Gyneco 2002; 99:553. 35. Sadeghi-Nejad H, Kavoussi LR, Peters CA. Bowel injury in open technique laparoscopic cannula placement. Urology 1994; 43:559. 36. Hanney RM, Carmalt HL, Merrett N, Tait N. Use of the Hasson cannula producing major vascular injury at laparoscopy. Surg Endosc 1999; 13:1238. 37. Dixon M, Carrillo EH. Iliac vascular injuries during elective laparoscopic surgery. Surg Endosc 1999; 13:1230. 38. Hulka JF, ed. Textbook of Laparoscopy. New York: Grune and Stratton, 1985. 39. Nezhat F, Brill AI, Nezhat CH, et al. Laparoscopic appraisal of the anatomic relationship of the umbilicus to the aortic bifurcation. J Am Assoc Gynecol Laparosc 1998; 5:135. 40. Hunter JG. Invited commentary on "Three spectra of laparoscopic entry access injuries". J Am Coll Surg 2001; 192:490. 41. See WA, Fisher RJ, Winfield HN, Donovan JF. Laparoscopic surgical training: effectiveness and impact on urological surgical practice patterns. J Urol 1993; 149:1054. 42. Phillips G, Garryu R, Kumar C, Reich H. How much gas is required for initial insufflation at laparoscopy? Gyn Endosc 1999; 8:369. 43. Shekarriz B, Gholami SS, Rudnick DM, Duh Q, Stoller M. Radially expanding laparoscopic access for renal/adrenal surgery. Urology 2001; 58:683. 44. Green LS, Loughlin KR, Kavoussi LR. Management of epigastric vessel injury during laparoscopy. J Endourol 1992; 6:99-101. 45. Saber AA, Meslemani AM, Davis R, Pimentel R. Safety zones for anterior abdominal wall entry during laparoscopy: a CT scan mapping of epigastric vessels. Ann Surg 2004; 239:182.